Is there anything better than a lazy afternoon spent reading in a coffee shop? Answer: duh, no. Someone who knows this better than anyone is the one and only Book Baristas, our favorite connoisseur of the most perfect combination known to man. 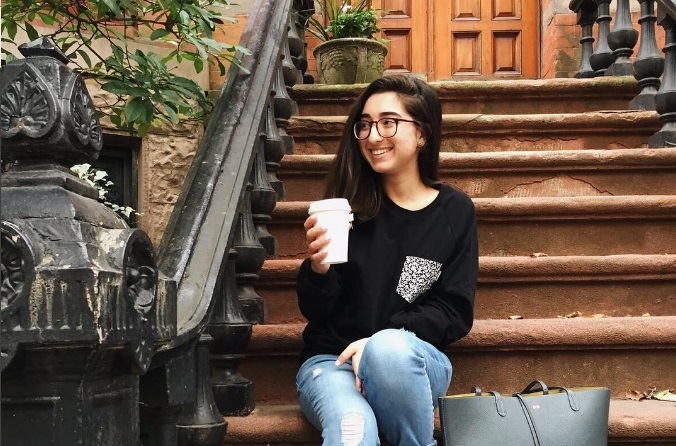 Her more than 111,000 Instagram followers love her snaps of NYC neighborhoods, publishing behind-the-scenes, adorable bookstore shelves, and more than anything, her beautiful shots of books paired with delicious-looking coffee drinks. Don’t believe me? Take a gander. In honor of National Coffee Day, we talked drink preferences, book genres, and photo tips with Natasha, the woman behind the ‘gram. Spoiler alert: in addition to being crazy talented, she’s the sweetest person you will ever meet. Glommable: How long have you been blogging as @bookbaristas, and what is the best thing about book blogging/bookstagram? Book Baristas: It’s been just over two years since BB was born, although it absolutely feels like just yesterday since it all started. There are too many amazing things about book blogging (the books! the coffee! the photo ops!) but I’d have to say the friendships that I’ve made thanks to bookstagram definitely tops the list. Finding that connection, that fierce love of reading, with people from all over the globe on one platform has seriously been so wonderful. Being able to connect with readers, and even authors, and talk to them on such a personal level is easily my favorite part of this whole blogging experience. G: As your handle suggests, you are spectacularly good at taking photos of books and coffee together (the coffee always looks sooo delicious). What are your tips for taking a great #booksandcoffee shot? BB: *blushes forever* Thank you!! Hm, as with any other great shot, always keep your lighting in mind. Natural lighting over everything else (this is my golden rule!). The coffees usually look perfect on their own so find a book that you think will look good next to your macchiato and get to snapping! G: How do you find new coffee shops, and what’s the best one you’ve found in NYC? BB: Sometimes I’ll happen to find coffee shops by chance, but other times I’ll look on Instagram for coffee shops that look adorable. One of my favorite coffee shop inspo accounts is @escapeyourdesk because all of the photos are absolutely gorgeous and the coffee shop recommendations are top-notch. My favorite coffee shop has to be the Bluestone Lane on Carmine street because I’ve become friends with the baristas, and I adore them all. They also share my love of reading and accept my recommendations with open arms. It also helps that their coffee is just so insanely delicious. G: What is your coffee drink of choice? BB: It all really depends on the weather (this is normal, right?). If it’s hot out, I’ll order my go-to iced soy latte. If it’s chilly, I’ll either grab a mocha, a cappuccino, or a soy latte. A pin I didn't know I absolutely needed 🐶 I adore @newyorkdog to bits and now I can carry her around with me!!! Grab your own pin via the link in @newyorkdog 's bio!!! 🤓 . . 👓: #Shade from @eyebuydirect & ☕️: #flatwhite from @bluestonelanecoffee! BB: I’ve actually never tried a PSL (cue the gasps). I’m not a huuuge fan of pumpkin (or spices in drinks) so I’m slightly skeptical. I’ll have to eventually order one to try, especially now that fall is here, but what happens if I don’t love it? Should I move to some remote place where the internet access is scarce and change my name? These are the things that keep me up at night. LOL. G: What’s the best book genre to sit and read in a café for a lazy afternoon? CLOSED // Winners announced in comments // Because I love this book so much and because my pals at @simonbooks are incredible, I'm giving away 3 signed copies of LILY AND THE OCTOPUS by @mrstevenrowley! 🐶 . . To enter: FOLLOW @simonbooks (bonus points for following @mrstevenrowley!) LIKE this post & TAG 2 friends who you'd like to read this with! (Trust me, you're going to need the emotional support!) 💙😭 . . Giveaway ends 8/20 – open to US entrants only. This giveaway is not affiliated with or sponsored by Instagram. Find more Book Baristas on Instagram, Twitter, Facebook, and her official website. Elizabeth Ireland is the publishing assistant at Touchstone, an imprint of Simon & Schuster. Current obsessions include reading everything Rebecca Solnit has ever written, watching Game of Thrones every Sunday, and listening to the Modern Love podcast on the subway. She comes to New York by way of Minnesota and still occasionally says silly things like "pop" and "baygel."